The last week has been a bit busy, what with Wijk aan Zee going on not to mention Queenstown. Every three years this little New Zealand city has hosted the southern Hemisphere's best Open tournament. Darryl Johansen has surprised everyone including himself with another spectacular performance. Luckily I am doing a Small Business course in the mornings so I can catch up on much needed sleep then. 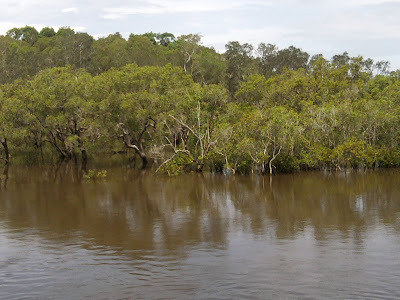 We have had torrential rain this last week and many parts of Southern Queensland and Northern New South Wales have had to be evacuated. After many days of virtually uninterrupted rainfall today the sun shone through. Just in time for Australia Day. Here are a few pictures of the aftermath of mother nature's fury in our area. 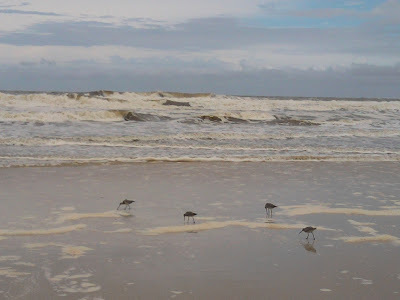 Tomorrow the rains are said to continue. 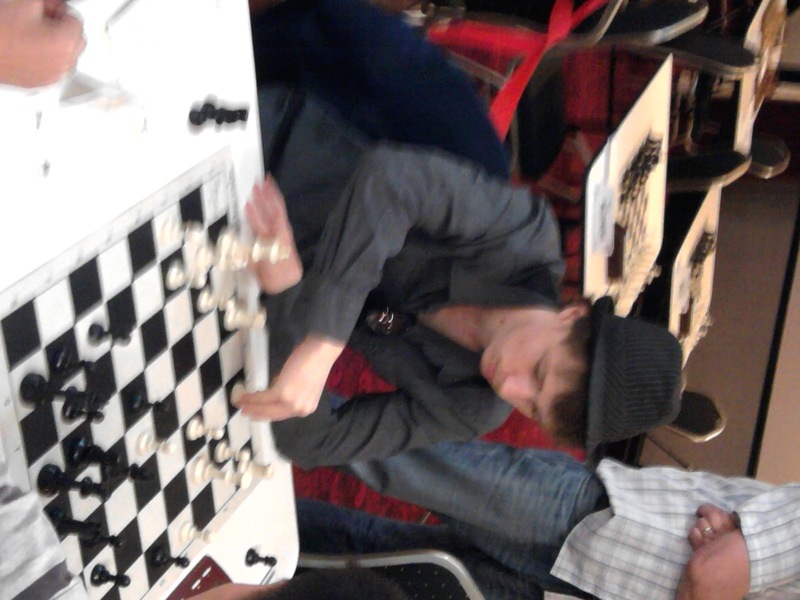 Fellow Northern rivers chess player Justin Adams allowed me to post this photo. He has a brand new lake on his property. Brunswick river is a bit higher than usual. 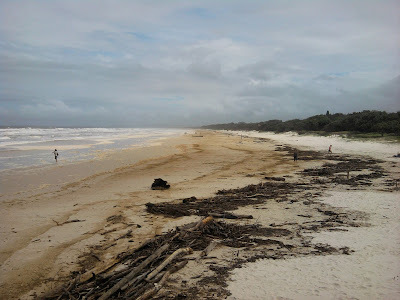 Lots of firewood has been washed ashore. Yay! Beach party! These birds usually feed elsewhere. Perhaps the river washed some earthworms onto the beach? 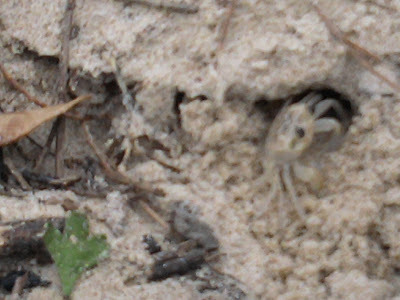 A Sand-crab busily trying to make a home. 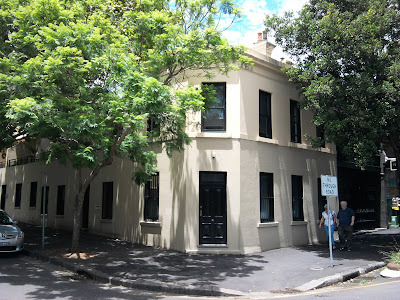 Speaking of restaurants, I passes the site of the Wooloomoolloo Woolshed. My parents bought it in 1972 and I think I peeled my first potato there at the age of nine. Until my early thirties I worked in every area of the restaurant in every capacity until my early thirties. I learned to play Poker there at the late night staff Poker sessions, learned what a good wine tastes like, how to make a Boeuf bourguignon, and many other things. 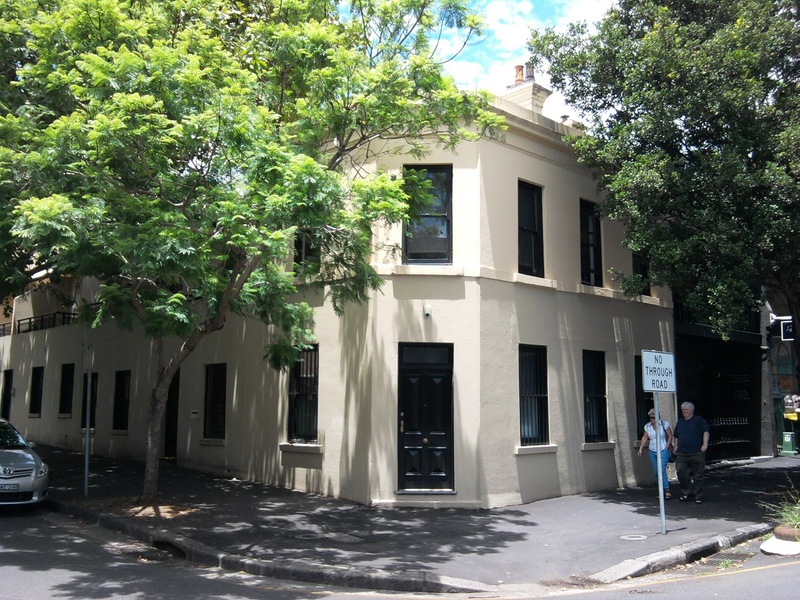 Now it is a block of apartments with only the facade remaining due to heritage listing. While many human endeavours and achievements fade like the colours of cheap curtains the best (and worst) games of chess players will remain as long as we have databases. 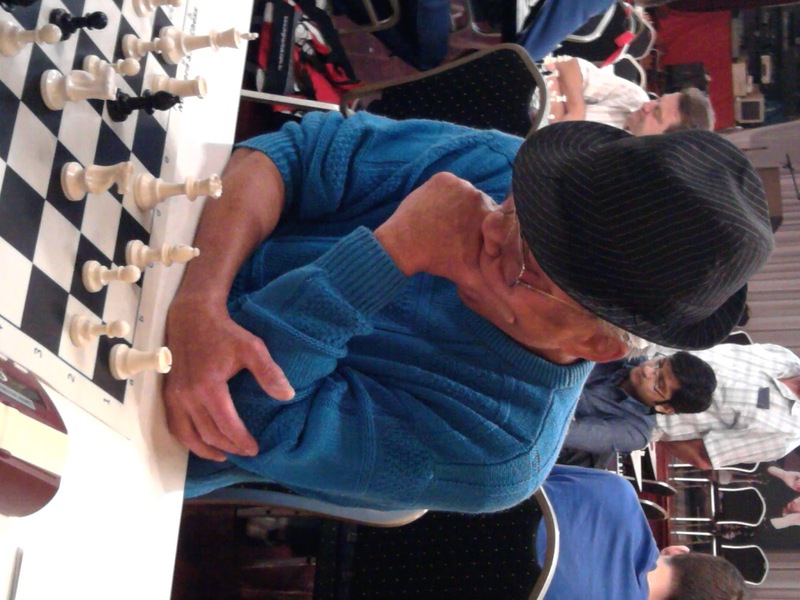 Naum Levin is a Soviet master and trainer who emigrated to Australia in the late 70's around the time I started playing chess. I remember him well. 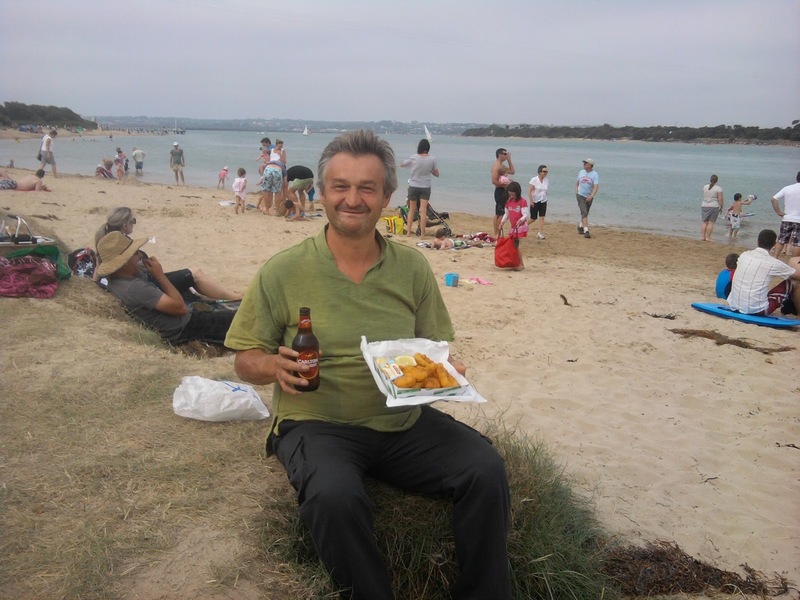 For some years he played and taught chess in Sydney but eventually he quit altogether only staying in tough with a few selected friends from the chess community. Here is one of those games I spoke of. 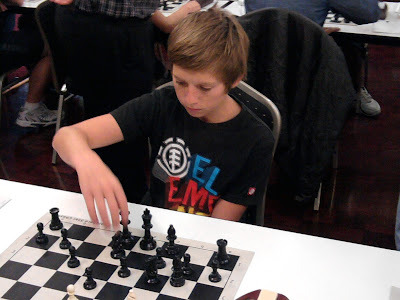 I will not speculate as to why he withdrew from the chess community but I imagine if we had made some effort to enable him to make a dignified living plying his trade he would still be teaching if not playing and Sydney would have several GM's and many IM's. A young Kasparov was one of his students! 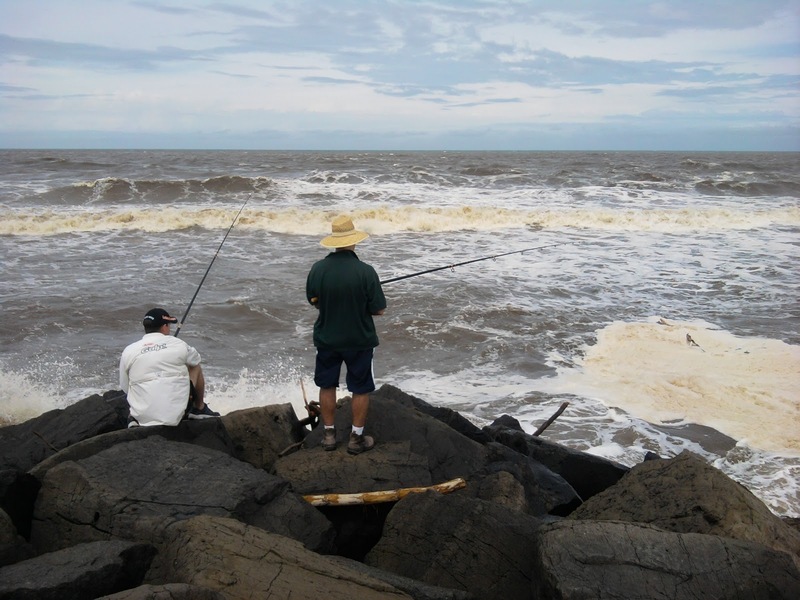 Now I am back in Brunswick heads enjoying the beach and the many events like the Brunswick Valley Woodchop. Judging from the commentary some of the worlds best choppers were here. There were mixed pairs, seniors, Saw and Axe. 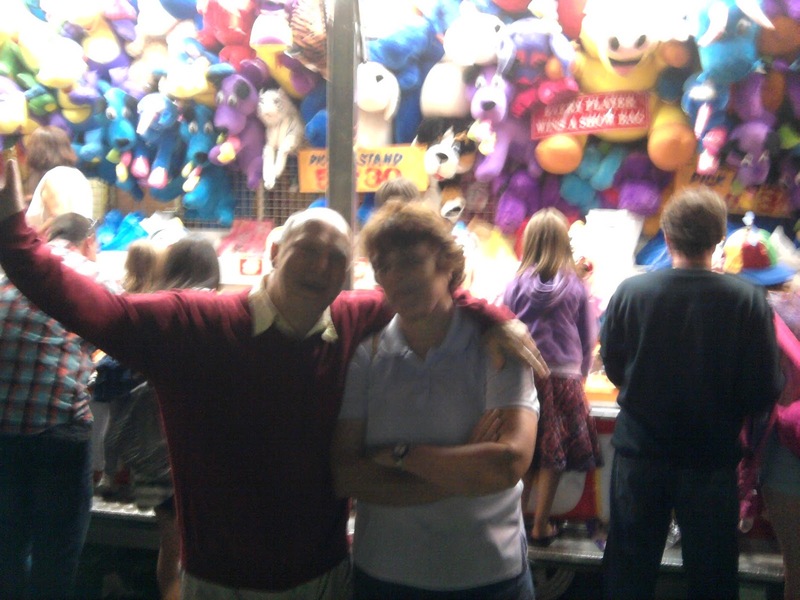 The over 65's I think!
. I am in the Bar of the Sphinx. Unfortunately the free wi-fi is not working. Luckily I have a mobile broadband USB stick with me courtesy of Isage. Having internet everywhere is good insurance. Check the site for all the results. A wrap-up will come when I get back home. Toodles and thanks for watching. Yay! Finally won a game again :-) After three draws I felt I needed to play sharply so I wheeled out 1.e4. My opponent played the Caro -Kann defense which is notoriously drawish. The line I played was the sharpest I could think of. Bill neglected his development just as I had yesterday and never got to castling. Bad news in an open position. Tune in tomorrow for the final round. Here is the link. The old guys are leading, Darryl Johansen by half a point, followed by Vladimir Smirnov and Steven Solomon. Vlad's son Anton is also doing well on 50%. If the table was any higher he wouldn't be able to see the pieces. I stole this picture from the photo gallery. 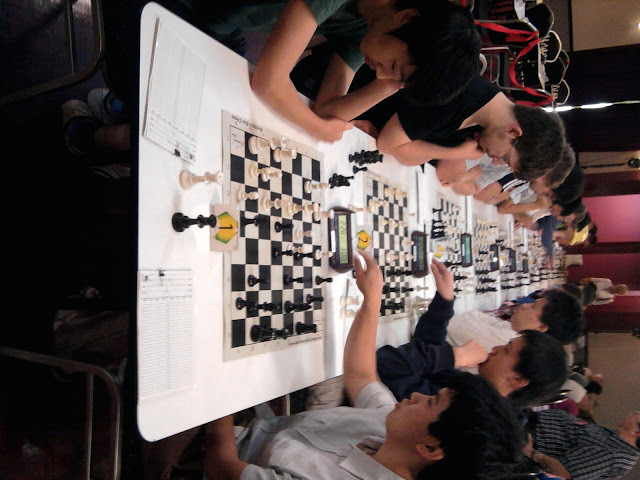 Steven beat Zong Yuan who is having a shocker. Perhaps he is too happy since getting married to play his best. I had another exciting game that fizzled into a draw but I shouldn't whinge too much because my position at one point was dreadful. 12. .....Bc3 was awful. As I keep telling my pupils, develop your pieces before getting clever. Instead 12. ...Be6 and black is perfectly fine and more importantly has nothing to calculate. I was greedy but initially missed that I can't take on e4 after 15.f4 If I may quote Danish chess legend Bent Larsen, "long variation, wrong variation". The only Senior player seen on the top boards all tournament was ever youthful Steven Solomon. He ended up 12th. Martin Jack represented the Gold Coast proudly and will be a force to reckon with in a few years I imagine. 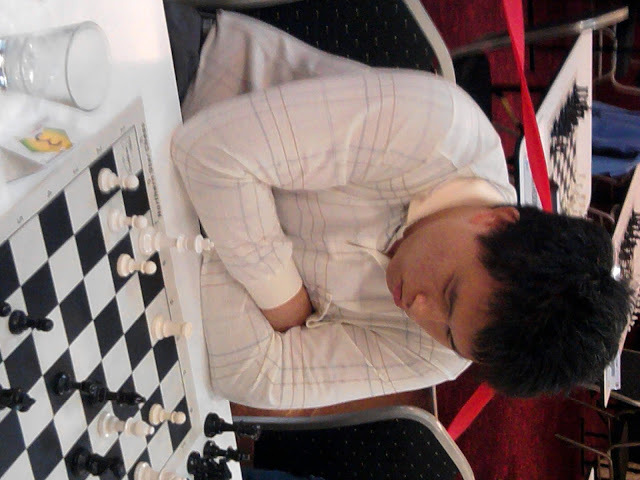 Gene Nakauchi, also from the Gold coast finished on a very good 6.5 points. Sally Yu giving Akshat Khamparia the stare. Chess Legend Doug Hamilton was beating up some kid on the top row in the background. 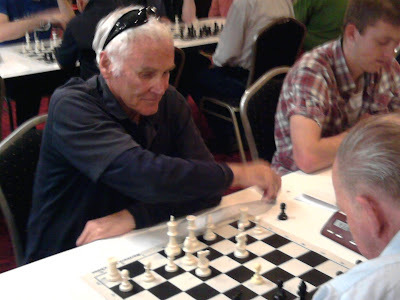 The only senior player to finish in the top 10 was IM Leonid Sandler. He showed that organising does not affect your blitz skills. 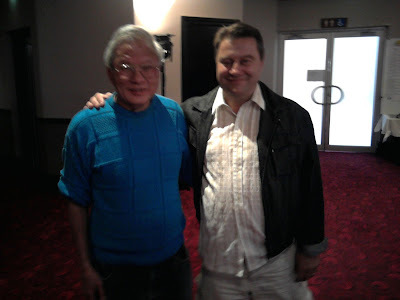 Next to him is chess legend Richard Voon who regular readers will remember is also a fine cook. 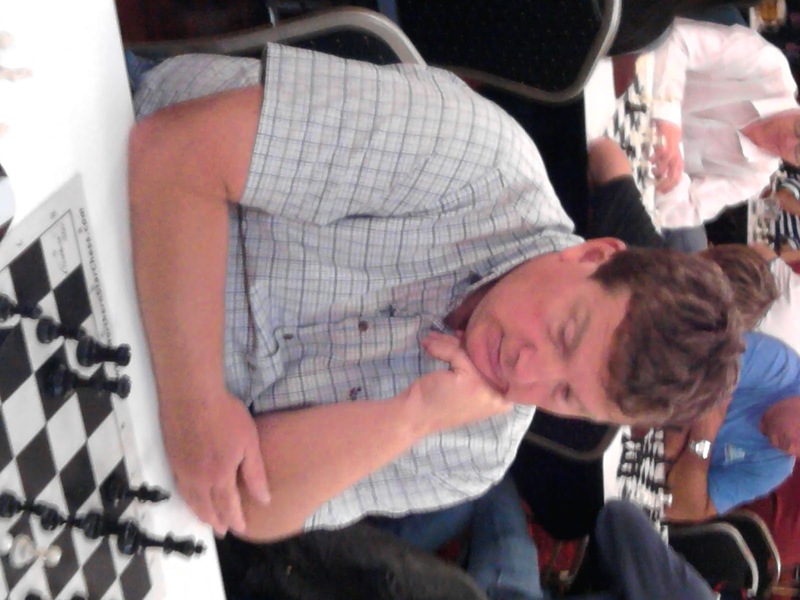 I have known Richard since I started playing chess and his scalps include GM Ian Rogers, IM Greg Hjorth and myself...several times. At 73 years of age he still plays in every tournament he can and can never get too much chess. When his game is finished he can be found analyzing, blitzing or spectating. He is also a trendsetter. Is my FBB (facebook buddy) James Morris wearing the same hat or do they own one each? Here Doug Hamilton is beating up a more senior player. He does not discriminate. Zong Yuan Zhao who is normally a deadly blitz player was not showing his best. I imagine his academic career must be eating away at his training time. Smart move! Leteisha Simmonds is Queensland's Junior girls hope and hails from Brisbane. She led the Somerville house girls team to the national interschools title in Sydney in December. I didn't play because I felt I needed a rest but as soon as the games started I wished I was playing. Instead I put on my journalist hat and hung around anyway! Also not many pictures turned out very well. I definitely need a proper camera. 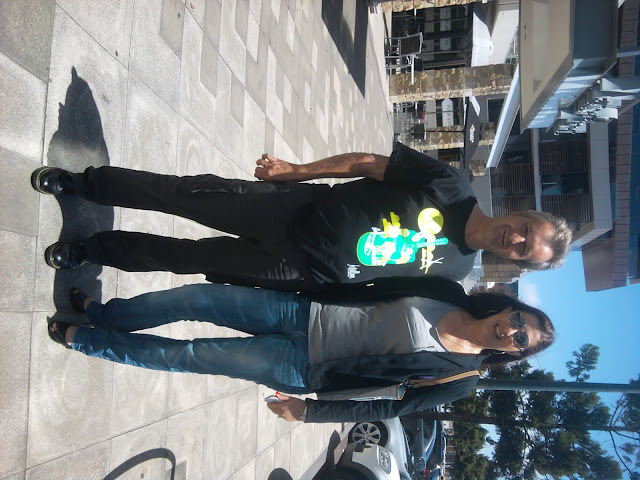 One of the main reasons that I came to Geelong was to catch up to old friends or that's what I am telling myself now that the tournament is not going that well :-) This morning I had coffee with one of the oldest and dearest, Katrin Alajova Kusznirczuk. Katrin is a twice former World Chess Champion, having won the girls U16 in 1986 and the U18 in 1989. She also won the Australian Women's Championship in 1992 the same year I won the Championship. 20 years later she still looks as good as ever. 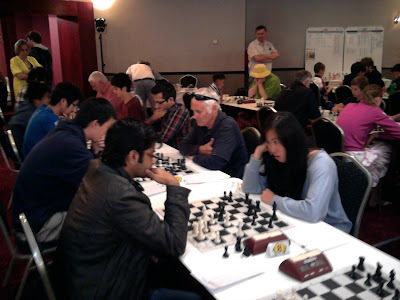 Unfortunately she like many other Australian chess players no longer plays but why is a story for another day. There is also no Women's championship for her to play in even if she had wanted to take the title again. Like I said, another day. Ben was the hero of the day, winning in spectacular fashion against Sydney chess organiser and enthusiast Trent Parker. I had another exciting game against our Indian participant. Akshat won the strong Sydney international last year in spectacular style and performed very well in the Doeberl cup as well coming 4th and scoring an IM nornm in both tournaments. A tough opponent. We had a very sharp game with chances for both sides. I guess a draw was a fair result. Three games to go and Darryl Johansen is a point ahead of the field and looks to be cruising to victory. If he does close it out it will be a fully deserved victory. Tomorrow is a rest day and another chance to look around a bit. Toodles amigoe's. A fun game today against Australia's strongest player. We have met nine times so far and this was our first draw. I won the first seven, admittedly when he was a kid, then he beat me easily in Sydney a few years back and this is game number nine. Statistics courtesy of Yuan. 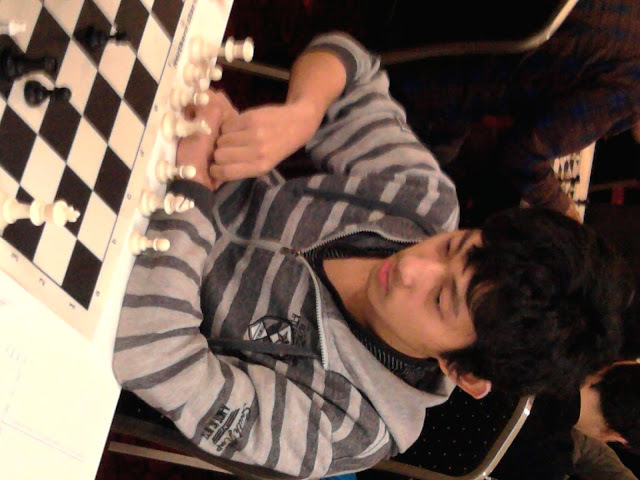 The opening was a Reti, patiently taught me by an Armenian friend who is not a bad player. We both felt that white got a slight edge in the ending. I got into bad time trouble again but did not blunder anything and despite some wild flaying by both sides the game never departed far from equality. Well folks, not a great way top start the year. I played a talented young player from Canberra who was not showing his best today. He thought a long time in the opening, played some dubious moves and got a lost position with no time in the clock by move 15. By move 20 he was 2 pawns down and playing on the increment while I had more than half an hour. I was already expecting to win and natural endorphin's flooded my brain. This is a dangerous time for a chess player because it can lead to the oversight of the most basic moves. In this case a check. I did not see 32.Qe8 check after which I am mated. That is how you can throw away a tournament. A single moment of carelessness. I must give credit to Junta for finding ways to continue the game with no time and no position. 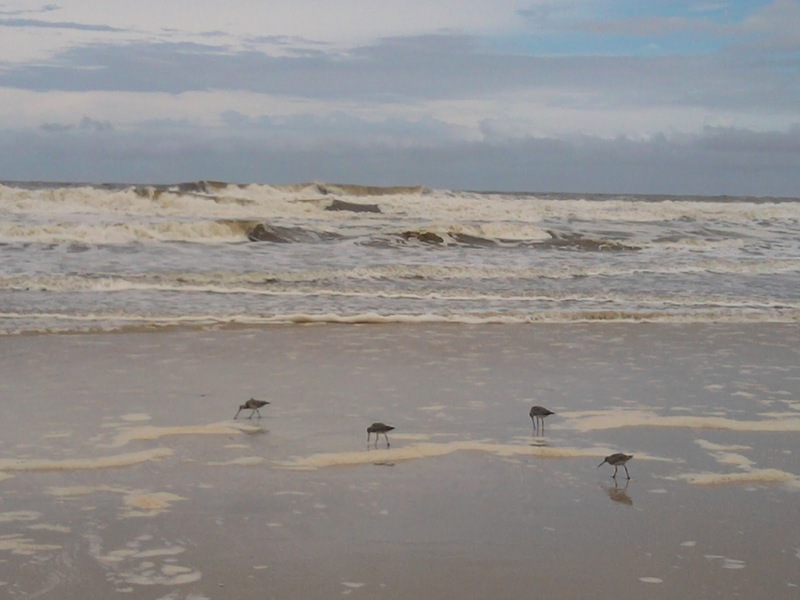 New Years Day beach adventure. Welcome to 2012! Geelong was quite sedate on New Years Eve compared to some places I have been. Robin (Ben's wife), Ben and I had a quiet night and just took a walk along the esplanade where families and well behaved people enjoyed a fair and some quiet drinks. 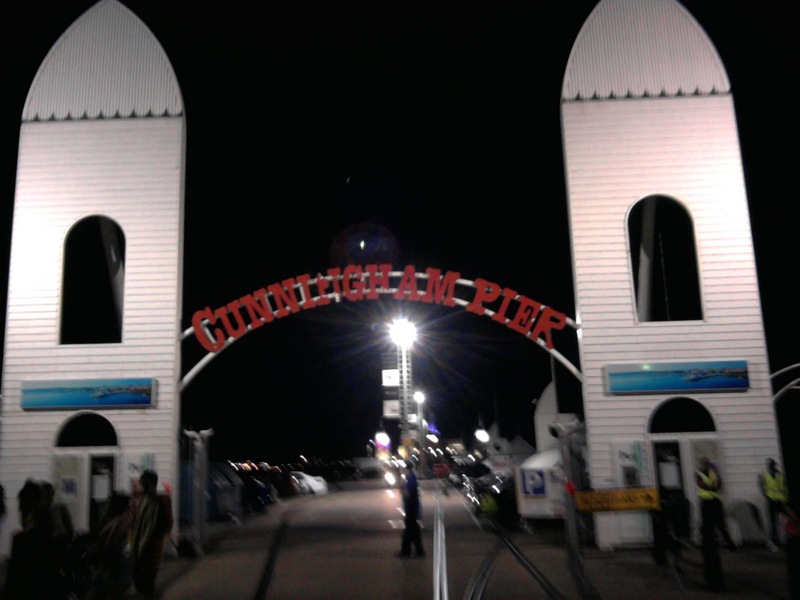 The pier has some restaurants and a nightclub on it but they were booked for a private function. to a top 10 of horrors that had happened in 2011. Great way to bring in 2012 guys. we decided to do some tourism. As it was a hot sunny morning the beach seemed like a good idea. 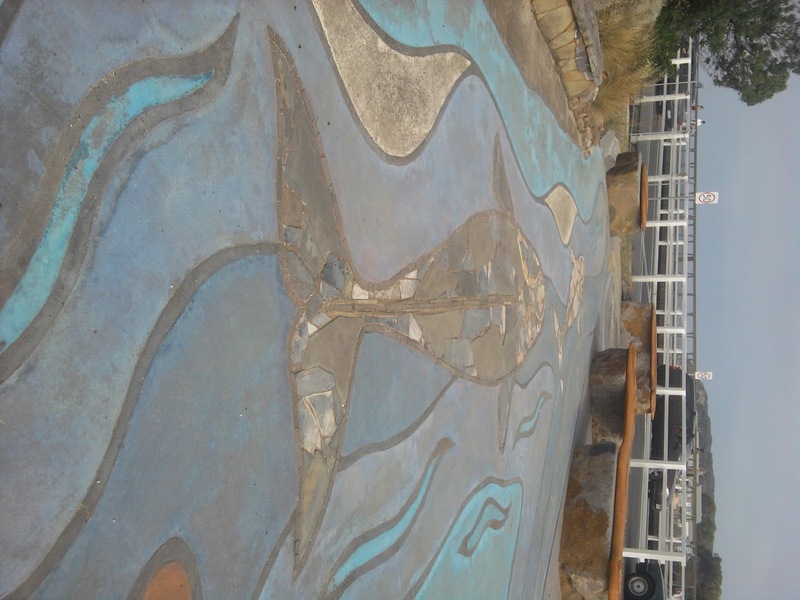 Our first stop was in the seaside resort town of Torquay. 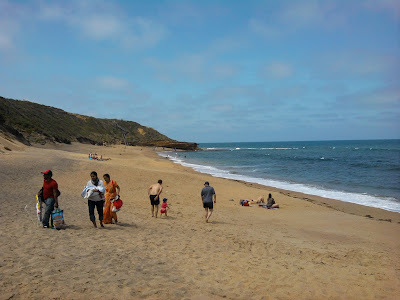 We wandered around a little to check out the shops and then headed down the beach. Not finding any parking despite driving around a while we headed out of town. Not far away is the famous Bells Beach. The car park was only half full and the water was perfect. A nice place to celebrate Robin's birthday. Ben must consider himself lucky. We men are notoriously bad at remembering important dates. 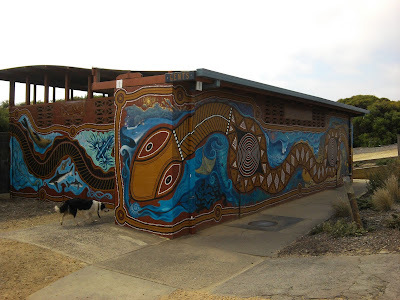 Now to something else I really appreciate in Australia. We have public facilities everywhere. 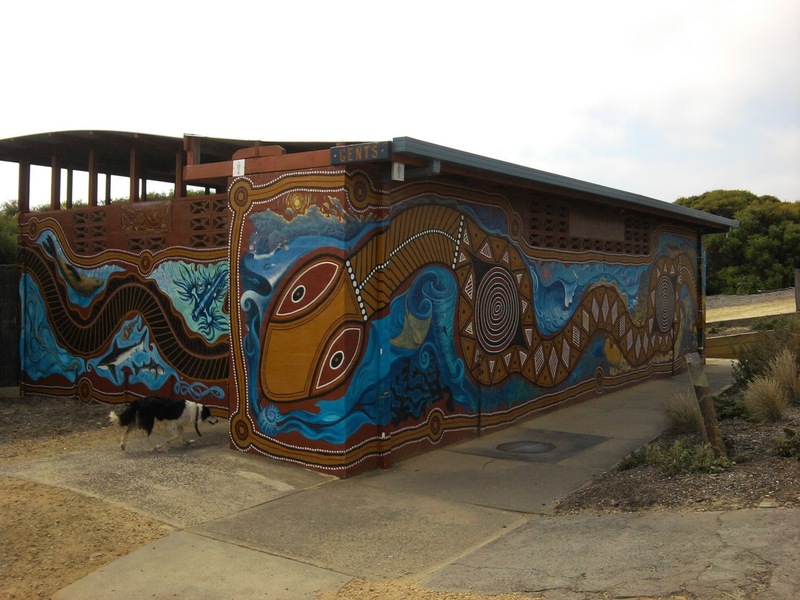 Not only are they ubiquitous and generally clean but in this case also artistic. A Doubleroo thumbs up to the council responsible for Bells Beach. 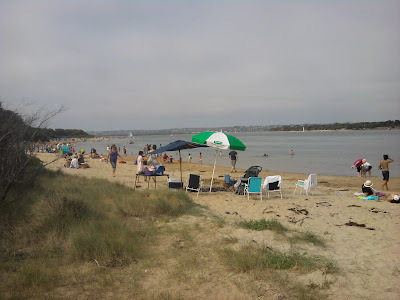 As you can see the beach was also not overcrowded. 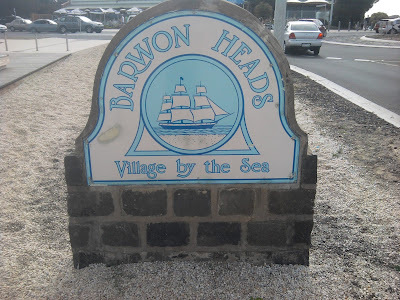 In Geelong and Torquay it was. 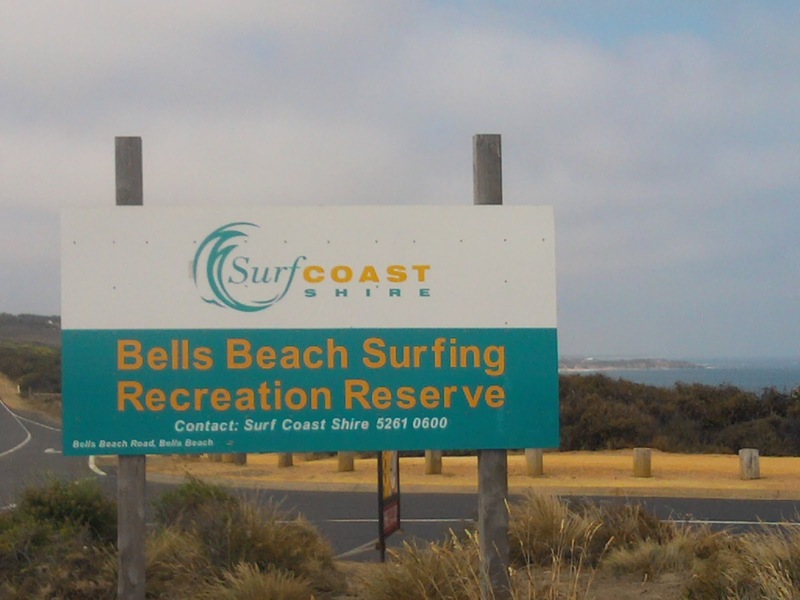 From Bells one can take the tourist drive back to Geelong via Barwon Heads. We stopped for Fisherman's Baskets ( Fish, Prawns, Scallops, Calamari and Chips) and took in the sights. Even the sidewalks are decorated. Tipping my hat again. Many families enjoyed the great summer weather by the inlet. Back to chess tomorrow folks, hope you enjoyed this break in games and if you have not been in this area of Australia or Australia at all yet I can thoroughly. Recommend it. 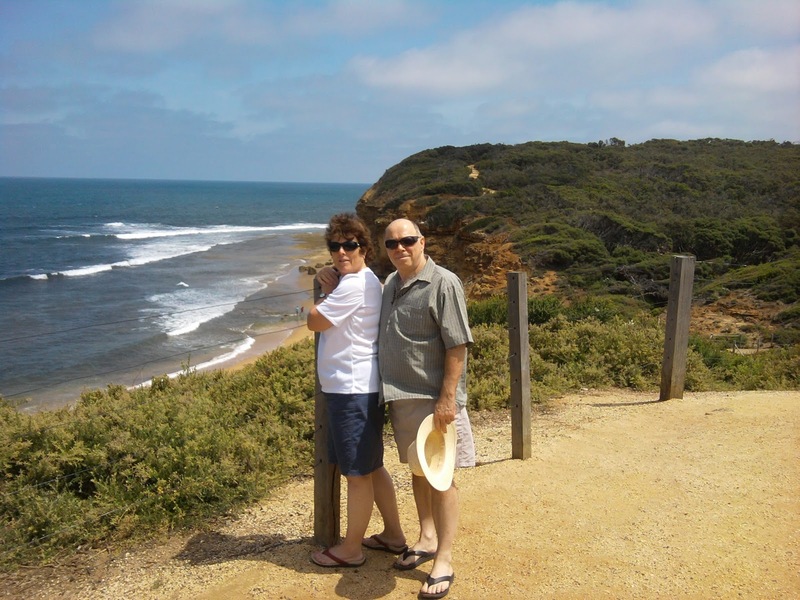 Check out the "Great Ocean road" and convince yourself.